Here, it should be mentioned that the title and main poster are a bit misleading. The poster misidentifies the main protagonist, and does not represent the story at all (maybe, intentionally so). The title of the film also does not capture the story line, and something along the lines of ‘God’s Hand’ would have seriously been better (the Brazilian title is actually ‘The Devil’s Hand’). The initial title of the film was actually set to be ‘God’s Hands’, but Bill Paxton and Brent Hanley decided against it (the IMDb trivia), suffering marketing problems latter on (why be blasphemous really?). What is instantly evident is that ‘Frailty’s narrative and story flow are exemplary. Disturbing, shocking and totally thought-provoking, the film succeeds in inducing the atmosphere of tension, thrill and, finally, disbelief. The film grows to become really disturbing, maybe largely because it involves young children, reminiscing the scenes from such truly horrifying films as ‘Sleepers’ (1996) and ‘The Girl Next Door’ (2007). The film is also very interesting psychologically-speaking in that it enables one to get a glimpse into a very interesting situation: the deterioration of a parent’s mental state and the impact it has on a child’s psychological state and his/her future actions. The influence of a parent’s ideology on a child’s construction of reality can be extremely great, and the film explores this theme in depth. In that way, ‘Frailty’ script is very interesting and the film tackles this emotionally difficult topic well. This is especially surprising given that the film is Bill Paxton’s directional debut. The cast seems perfect, and the acting is also good: Bill Paxton as dad Meiks impresses, as does Matt O’Leary in the role of young Felton, the older son. Despite a critical acclaim from many directors, including James Cameron, and critics, for example, Roger Ebert (who gave the film four out of four stars), the film is not a perfection. Aside from its unrealistic story spin, the biggest flaw lies in the film’s ending. There is a twist in the film, but it is not as mind-blowing as one would expect from such a film. The ending leaves one if not totally frustrated, than at very least somewhat disappointed, especially given the sense that the plot story was well thought-out. It becomes a conundrum as to what was really going on in Brent Hanley’s (the writer) mind when he decided to leave the viewer with the ending that is that distasteful and unsatisfying. 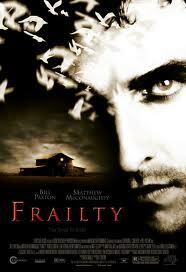 “Frailty” is one of those guilty pleasure movies for me. The twist may not be “Sixth Sense” territory, as you point out, but I found it effective, and the last few minutes are wonderfully chilling. Bill Paxton did a fine job with the direction, along with playing the father. Thanks. Yes, in retrospect, it does not appear that bad, but as it certainly upsets when viewing for the first time, I think that should count more, so it still is. I appreciate your opinion on this film. I hold it in high esteem, I think Paxton should have had more big cinema opportunities based on the merit and success of Frailty. Likewise appreciate the ambiguity of the ending. How you feel about the ending depends on your perspective and your beliefs on faith and the supernatural. To me it is challenging the intellectual tendency to dismiss faith. It is asking the question, what if things aren’t what they seem to be? What if there is something more? Thanks for reading. I remember I had no problem whatsoever with this film save for the ending. I probably should re-watch this film again – maybe I will like the ending more – or understand it better. I thought the marketing could also have been better – wiser – of this film. Paxton was talented, indeed.